The Metro Board meets on Thursday at 9:30 a.m. at Metro HQ for its regular monthly meeting. As usual, the meeting is open to the public and will be live-streamed. A pdf of the agenda is here. •Approve $290.2 million in state cap-and-trade funding for the Gold Line extension to Montclair project. Staff report. •Approve $1 million in funding for predevelopment activities for the Metro Transportation School. Staff report. •Approve the state’s reprogramming of $74 million for the Raymer to Bernson double tracking project in the San Fernando Valley on Metrolink’s Ventura County Line. Metrolink has said that double tracking doesn’t offer benefits until train frequencies increase to every 15 minutes. Staff report. •Receive-and-file an update on Metro’s Bike Share program and its new business plan. Staff report. 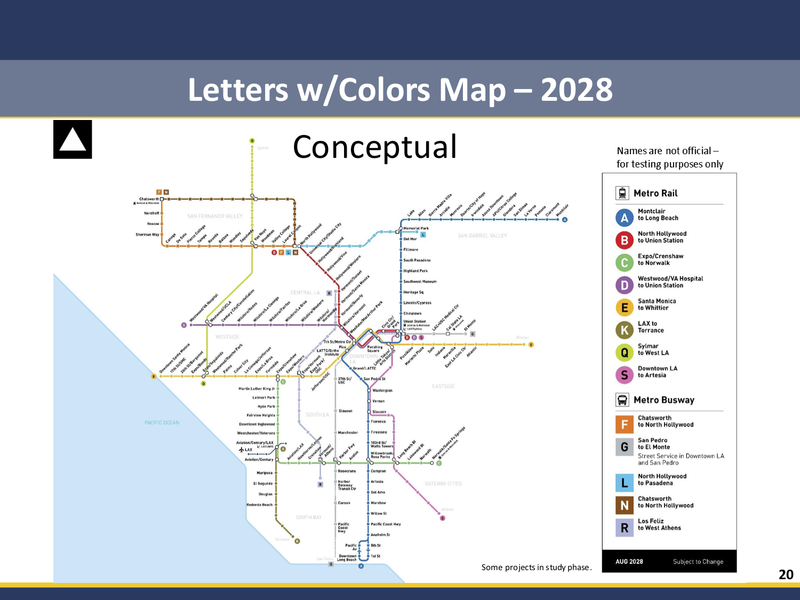 For the renaming, keep it simple: letters for Metro rail lines, with colors for signage and displays only. Save numbers for bus lines. Using letters (with colors) is definitely the best option. And it is good they are discussing this since I believe the current color only naming pattern is not sustainable and already has an issue. Numbers with colors: Still better than colors only. 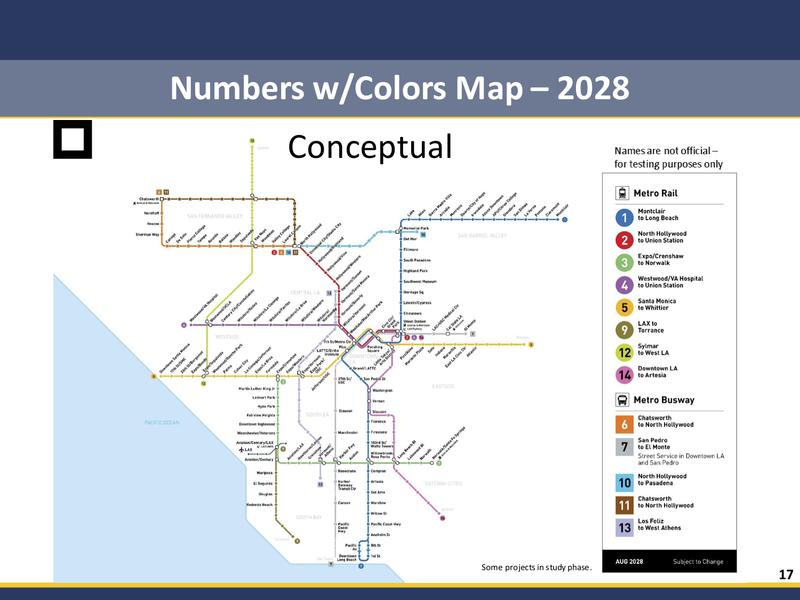 If you are going to differentiate rail and brt from other buses, such as “rail map” with brt already, then using letters will help, especially with how many buses with numbers currently run all over Los Angeles, both Metro and others. Letters with colors: You can’t confuse one letter for another letter like you can with colors. Colors will help associate memory for signage and maps still. Letters instead of numbers differentiate one of the largest bus networks in the country with all subway, light rail, and bus rapid transit routes. Color only: We already have confusion now with Expo and Blue being shades of blue sharing stations, we don’t need more confusion over aqua and olive vs blue and green.